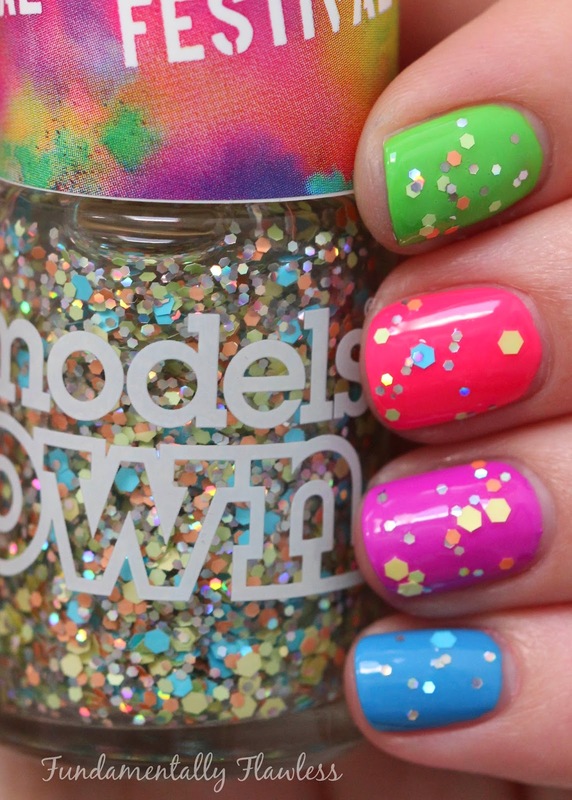 Models Own surprised us again a couple of weeks ago with news of another brand new collection launching - the Festival Collection* - four bold neon brights and a glitter topper. I adore the warmer months and being able to get away with the brightest colours on my nails - particularly neons - and I don't think I can add enough to my ever-growing collection of polishes. 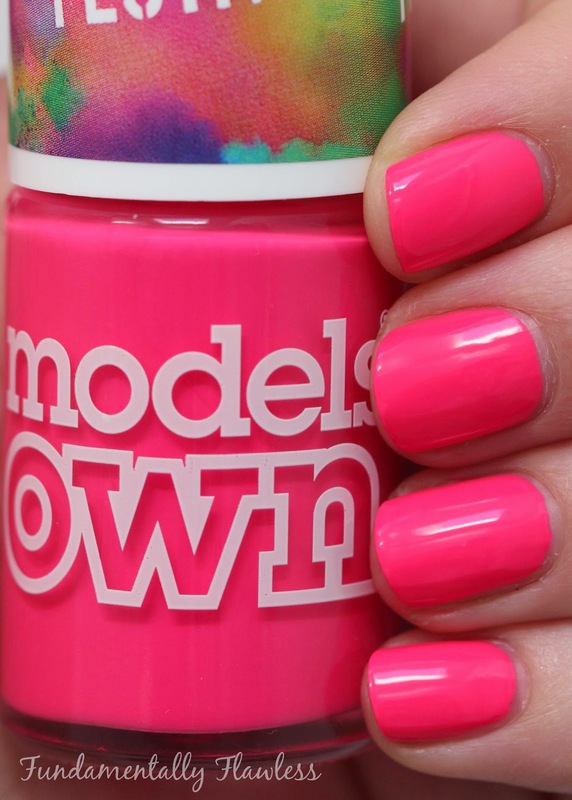 This is the third neon collection from Models Own (the Ice Neons came two years ago and the Polish for Tans last year) and yet again they have come up trumps. 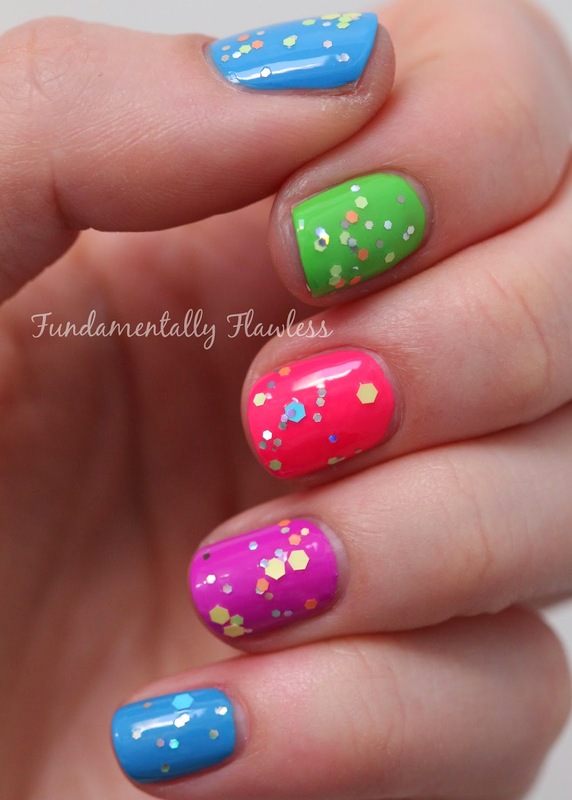 Even though I'm not a festival go-er, these colours will be gracing my nails a fair bit as we move into summer. 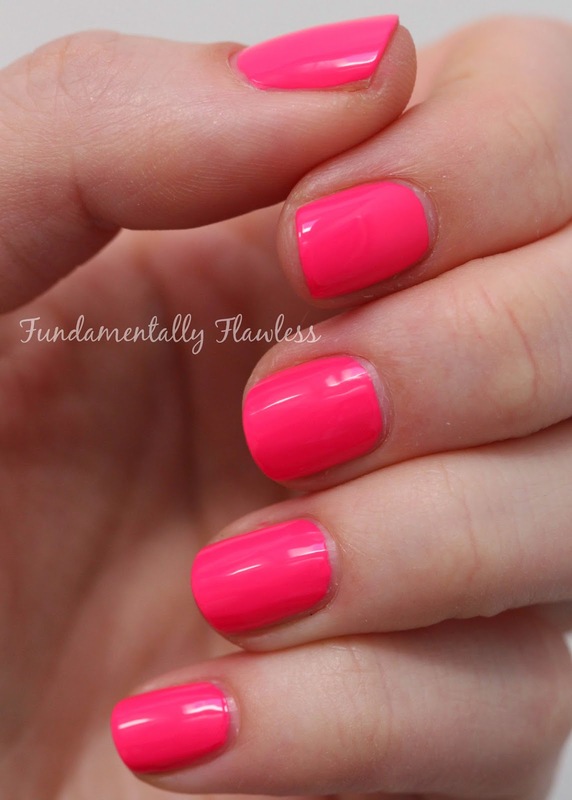 These polishes have a good consistency and dry surprisingly quickly. I didn't try them over a white base, but they popped nevertheless! Green Fields* is a bright spring grassy green. 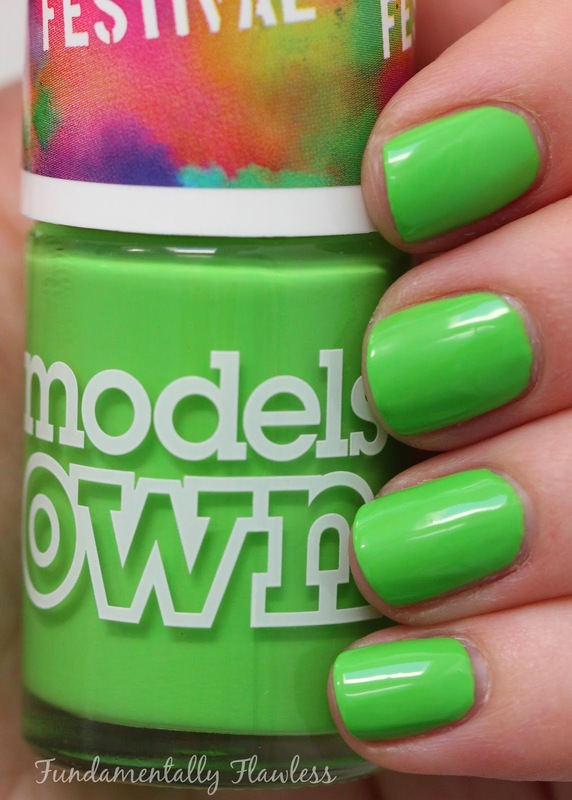 If you're a regular reader of my blog, you'll know that I'm not really a fan of green nails, but when I tried this one out I actually rather liked it. It's much less acid in colour than Toxic Apple from the Ice Neons and Flip Flop from the Polish for Tans - and therefore I would say a lot more wearable! These photos show three coats of the polish because I found it a little bit difficult to work with and get smooth. Pink Wellies* is a perfect pink neon - and I'm actually really pleased that the neon seems to come through in my swatch photos - though colour-wise it's actually a bit pinker and less red than the photos show. It's super girly and super fun and I cannot wait to wear this again. Photos show two coats. Blue Skies* is a bright cyan blue. I'm always looking for a proper neon blue and although this comes close, it's not really neon in its finish. 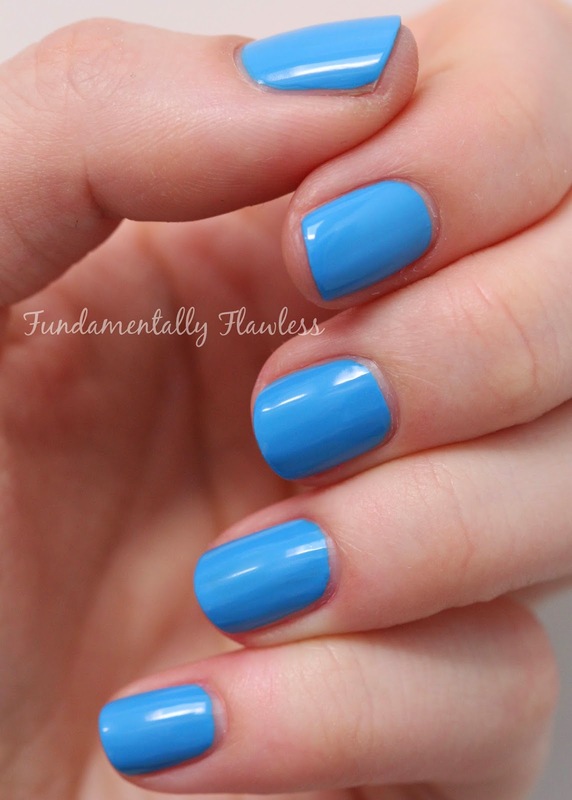 It is a beautiful blue, however, and definitely a fun summer colour. Photos show two coats. 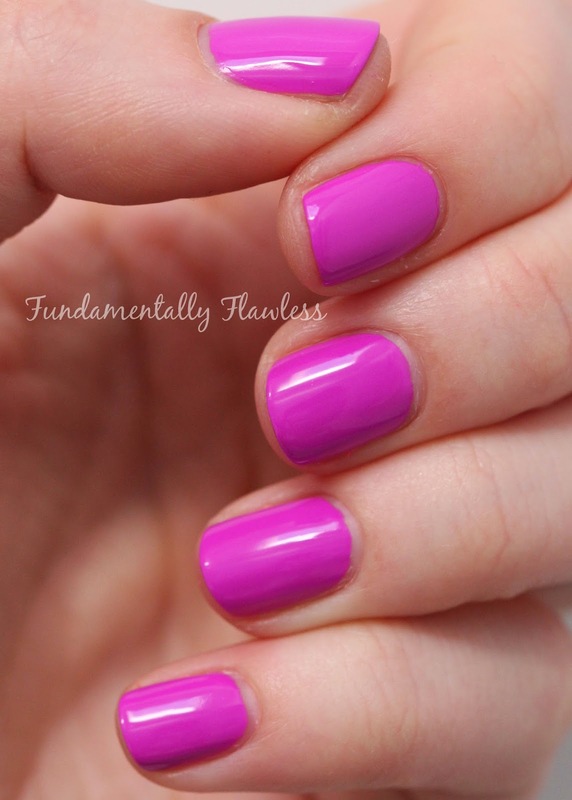 Purple Bandana* is a bright orchidy purple neon - from the bottle I didn't think it was going to be that special but as soon as I painted it on my nails I adored it - it really pops out and is so unlike any other colour I own (quite an achievement with my growing collection!) I really love this colour and it's by far my favourite from the collection. Photos show two coats. Colour Explosion* is a glitter topper - with a whole variety of big and little hex glitter in pastel blue, yellow, orange and silver. The photos above show just one coat of the glitter - as you can see, it's not heavy coverage at all, which I think is a little disappointing. 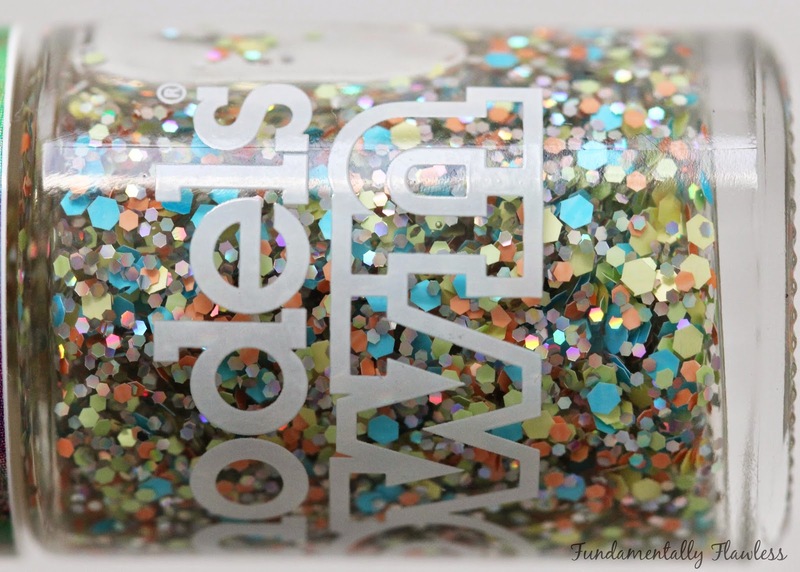 I'm not usually a big fan of a glitter topper, but I think this one would look cute over a black or white base. 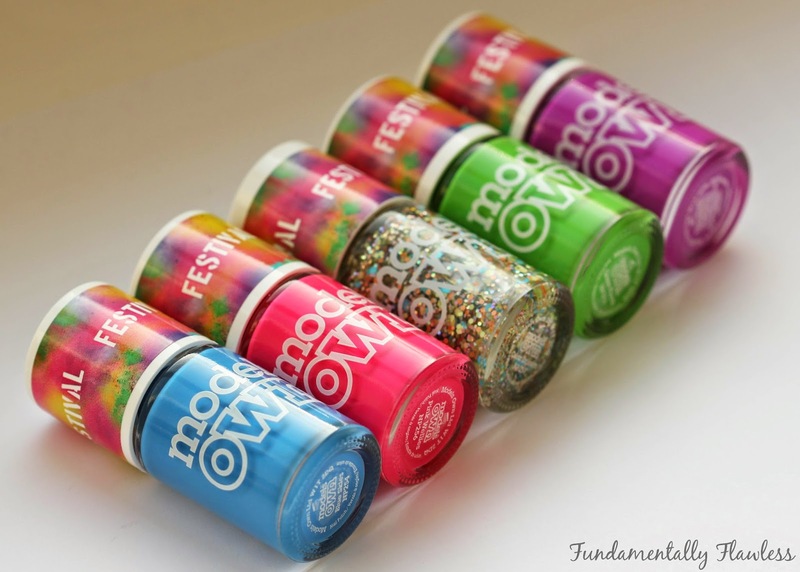 And just because who doesn't love a macro glitter shot...? 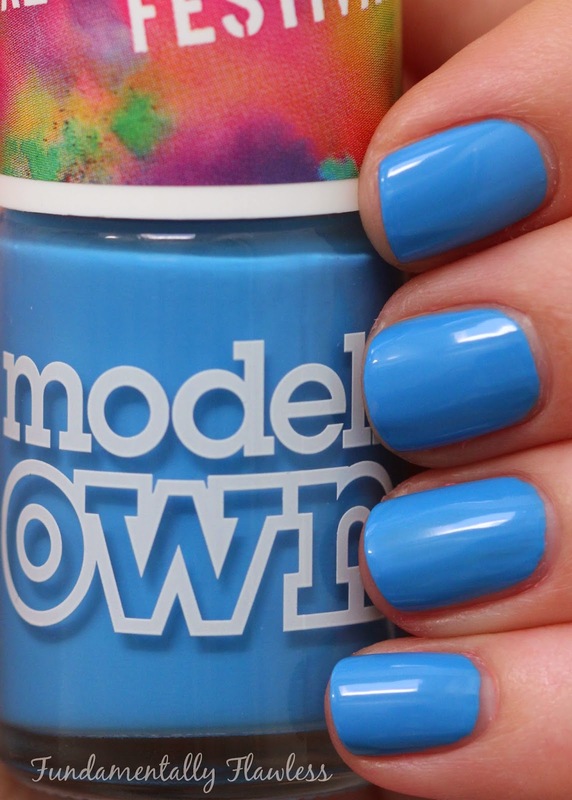 The Festival Collection is available now on www.modelsownit.com, in Models Own Bottleshops and in Superdrug stores nationwide. thank you so much for these lovely swatches! I was searching for some fine photos of this collection yesterday and unfortunately I found nothing. Do you have MO Bugglegum to compare it with Pink Wellies? I'd love to see if there's a difference between these two.